battenburgbelle.com » Asparagus season is upon us! I LOVE asparagus but I to try to stick to when it’s in season here, which it is at the moment. I like to put some in a simple green salad with avocados. It’s also lovely with some balsamic vinegar and shaved parmesan. But one of my favourite dishes, which is a great one when you have limited time and guests who don’t eat meat, is this roast salmon with dill sauce. The recipe is for four people. And when asparagus isn’t around, it’s great with green beans, tender stem broccoli, mange tout etc. Anything green really. Heat the over to 200°C/400°F/gas mark 6. Cook the potatoes in simmering lightly salted water. Whisk the honey, mustard, vinegar, 2 tbsp olive oil and chopped dill until thick and runny. Drain the potatoes and toss in a little of the sauce. 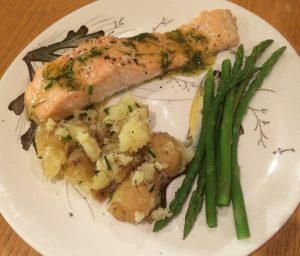 While the potatoes are cooking, line an oven tray with baking paper, brush the salmon fillets with olive oil and season well. Place them on the tray with the lemon quarters. Bake for 8 minutes or until cooked. Cook the asparagus or your other chosen green vegetables. Serve the fish with the potatoes, asparagus and the rest of the sauce. Sometimes I crush the potatoes with a little olive oil and some chopped chives. Just saying. Cook the fregola according to the instructions on the packet (around 12 minutes in boiling water). In the meantime, gently fry the leek in a little olive oil until soft and starting to brown. Drain the fregola and stir in the leeks. 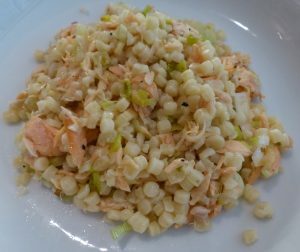 When this has cooled to around room temperature, add the salmon, lemon and season to taste. It’s lovely and you should try it.